A few weekends ago, I was lucky enough to spend two nights and a few lovely days in Portland, Oregon. It was a deliberate destination, a targeted trip for a special weekend with four girls: my mom, her sister/my aunt and my cousin/their niece. If you are getting brain twitches: it just means we are all related, all girls and like spending time together. Every few years (though we have vowed to make it annual), we pick a city to transcend on for a weekend. It was a fantastic weekend and secretly I was all warm and fuzzy inside knowing that this visit precedes yet another: I plan to return to Portland for Portland Dining Month. Put some gas in your car and snag a room: June is Portland dining month. And I already have plans to taste more farm to table, brilliant food come mid-June. (More on this later in the post). 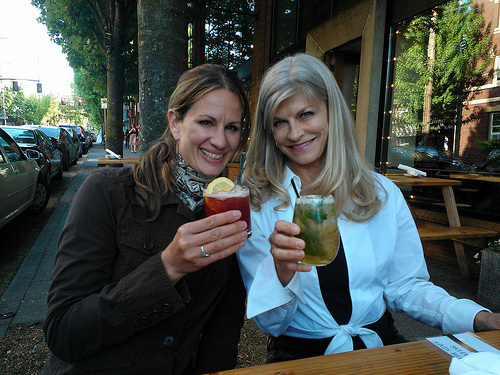 Our weekend meant my mom joined me in Seattle on Thursday. We shopped and talked, then stopped and had our nails and toes done. She chatted up the ladies while getting powder pink embossed on her toes. Many smiles later---and with chins in the air---we took our fancy toes and nails back to my urban farm for a dinner with the family. Friday morning we peeled off and drove to Portland---racing two planes. My aunt and cousin flew in from Idaho and California, respectively. We all converged on Portland by noon. After dumping our belongings in the hotel, we showed up to enjoy Portland's renowned food cart tour. 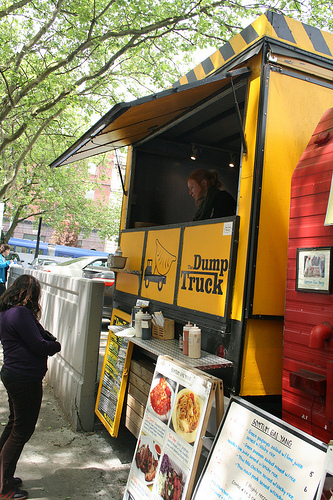 For 2 hours we learned about the accidental brain-child of Portland, a sea of food carts in multiple locations around the city. Now proud and embracing their obvious brilliance, you can tour the best of the best carts (according to the folks at Portland Walking Tours). After bites of pulled pork and salmon chowder, fried herring and tomato soup, not to mention German sausage and Korean meets taco... we were satiated and all the wiser to Portland's food scene. Immediately following the tour we thought it wise to take our quite-full stomachs and go to VooDoo Donuts---a bit of a Portland icon. We enjoyed a pile of doughnuts, resisted buying pink doughnut-laced underwear then wandered our way through the Pearl District, where we found a few stray boutiques and vintage memorabilia. After the Pearl we headed to 23rd Avenue, hitting countless adorable shops and noshing at 23 Hoyt for happy hour. Becoming famous for eating just after eating, immediately following happy hour we took a cab to dinner at Aviary (a restaurant on my short-list and now on yours for Portland dining month). Maybe, just maybe they had me at the birds. BUT logos aside the food was whimsical and off the wall, including a salad with watermelon and fried chicken skin, oxtail croquettes and chilled zucchini soup. I would recommend Aviary in a second. After stuffing ourselves in consecutive rounds, we rolled back to Hotel deLuxe (a boutique hotel harkening to bygone Hollywood Days, complete with black and white pics, demure attendants and I must admit: insanely comfortable beds and pillows). After a good night's sleep, we shimmied out of our beds and transcended on Portland for day 2. Which meant: go to Powells and eat pastries, spend a solid hour at Buffalo Exchange, waltz around checking out shops and snagging lunch at Kenny and Zukes. YUM. Pile my pastrami high please. Post lunch we hit Rogue Brewery, then decided to hit the Hawthorne shopping district, finally descending on the farm cafe for dinner. YES the name pulled me in. I admit it. The farm had good food. And we were there with good company. Does it get any better? Now it is your turn: make plans to jettison to Portland this JUNE. No less than 60 restaurants are participating in Portland Dining Month. Aviary, mentioned above, is one of them. I was also scoping out Lincoln and Bar Avignon but finally settled on Ping and Bent Brick for my own mid-month visit. There are so many good restaurants in Portland, and so little time. Best to get biting, chewing, slurping and what-not. Let me know if you go!